Charles Darwin University has joined an international consortium developing technology that will enable the instant delivery of voice-activated lecture material. 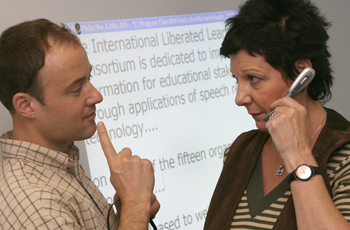 The new voice-activated computer technology allows students to follow their lecturer’s material on a screen as it is delivered – an innovation with enormous potential not only for deaf students and students with physical and intellectual disabilities but for the entire student population. CDU recently signed on with Liberated Learning, a consortium based at St Mary’s University in Nova Scotia, Canada that now has links with 16 institutions in eight countries. A research group based at St Mary’s has been developing the voice-activated computer software for the past seven years in partnership with computer giant IBM, which has developed a software program called ViaScribe. The lecture-captioning system has been adopted in universities across the world, including the University of the Sunshine Coast in Queensland and The Australian National University in Canberra. Liberated Learning’s international manager Keith Bain visited the Casuarina campus of Charles Darwin University to demonstrate the captioning system and hold talks with Support and Equity Services as to the way forward for the new partnership. Mr Bain says the consortium is committed to working with universities and other partners to further develop the Liberated Learning system and meet the challenges of providing new learning systems for the disabled or disadvantaged. He adds, however, that Liberated Learning’s research and development has proven beneficial to all students. ‘We’ve found that the automatic captioning system also leads to the improvement in lecture delivery by teachers,’ said Mr Bain. He says the aim of the St Mary’s University consortium is to create a living laboratory, working from scratch with its partners to build new technology. ‘In our partnership with CDU, we want to learn more about how the university wants to use the technology,’ he says. Elizabeth Macdonald, the director of CDU’s Support and Equity Services, said: ‘We’re excited to be part of the consortium, which is about sharing information and being involved in a global project working on the evolution of speech-recognition software.